Revenge is back in Fashion. It’s safe to assume that The Dressmaker plays out like a traditional, courteous affair, seeing as it features all the ingredients that make for a well-mannered period piece. Set in the Australian outback during the early 1950s, the film stars Kate Winslet, Finding Neverland (2004), as a woman who stitches fancy frocks in the small fictional one-horse town of Dungatar. The filmmakers however, have something entirely different in mind as The Dressmaker revels in its own anarchic, destructive nature, wildly hurling off the rails whilst stylishly embracing its kitsch craziness and dark humor. After a whopping 18-year hiatus, Jocelyn Moorhouse, Proof (1991), returns to the directing seat, this time tackling an adaptation of Rosalie Ham’s much-loved debut novel of the same name. With a screenplay by Moorhouse herself — her husband, fellow filmmaker P. J. Hogan, Muriel’s Wedding (1994), working as script editor — The Dressmaker explores themes of love, vengeance, artistry and of course, high fashion. The film — described by Moorhouse as Unforgiven (1992) with a sewing machine — tells the story of Myrtle ‘Tilly’ Dunnage (Kate Winslet), a glamorous, talented misfit, who’d been sent to a boarding school as a child, later spending her young adult years working as an haute couture dressmaker in Paris, France. Driven back to her hometown of Dungatar after being exiled 20 years ago, Tilly returns to south-east Australia in order to look after her sick, eccentric mother, ‘Mad’ Molly (Judy Davis), while trying to right the wrongs of her past, wrongs that continue to haunt her. You see, although Tilly instinctively feels that she’d been wronged as a child — her back-story and ostracization are eventually revealed through washed-out flashbacks — she’s unable to remember exactly what lead to her eviction. But, when Tilly sets up a dressmaking business in her mentally frail mother’s home, the bitter, gossipy and small-minded Dungatarians become bewitched by her astonishing skills of transformation, with Tilly — one by one — extracting the information she requires to piece together the truth while using her amazing gowns to avenge those who scorned her; I guess you can say, there’s a price to pay if you want to look this marvelous. While Moorhouse sticks very close to a well-worn story outfit — you know, the one where someone returns to their small town community and attempts to sort out their childhood baggage — The Dressmaker is so far-fetched, excessively unsavory and outright cartoony that’s it’s impossible to ignore its fashionably deranged energy. Tonally, The Dressmaker has more ups and downs than the big dipper, but all things considered, surprisingly works, thanks to Moorhouse’s knack at mixing comedy with drama. Spontaneously jumping from farce to gloom, one’s enjoyment of the flick will likely depend on how twisted one’s sense of humor is, given that The Dressmaker might be a tad too jarring for some, chiefly when it attempts to take itself deadly seriously when tragedy strikes in its third act. There’s also a little too much plot being shoehorned into the film — we’ve got domestic violence and bloody murder combined with physical gags and slapstick comedy — making The Dressmaker a hard sell to most mainstream audiences, which is a bit of a shame really. Spearheaded by a ripper cast, Kate Winslet is refreshingly wild as Myrtle ‘Tilly’ Dunnage, clearly having a great time playing the wickedly amusing seamstress, who returns to her hometown to get some closure by solving the mystery of the death that still grates her, whilst plotting her revenge on the folks who sent her away as a child. Clad in some extremely alluring costumes, Winslet’s fabulous wardrobe irrefutably screams, ‘I’m back and I’m going to make you pay attention,’ even her accent, a mixture between British and Australian, is remarkably adequate. Uniformly, Judy Davis, Deconstructing Harry (1997), is a hoot as Tilly’s acerbic, erratic, and not-as-mad-as-she-seems mother Molly, with Davis delivering a fun, high-pitched, scenery-chewing performance that’s equivalent to the insanity ensuing around her. Furthermore, both Winslet and Davis effortlessly veer through some of the film’s strange tonal shifts, creating a wonderful on-screen chemistry which brings about some of the flick’s most riotous and tender scenes — watching the women bicker and lust over Teddy McSwiney (a chiseled Liam Hemsworth, The Hunger Games: Catching Fire (2013), delivering his most charming performance to date) will surely have patrons in stitches — with the pair simultaneously nailing their mother-daughter relationship, the emotional fabric of the picture. Then there’s the scene stealing Hugo Weaving, who’s a constant delight, tapping into his The Adventures of Priscilla, Queen of the Desert (1994) persona for the role of Sergeant Farrat, Dungatar’s local law enforcement officer who harbors a cross-dressing secret of his own. The Dressmaker also features a plethora of well-known Aussie actors who bring depth and history to a number of the picture’s secondary characters. The wonderful Sarah Snook, Predestination (2014), plays Gertrude Pratt, the town’s proverbial ugly duckling, who becomes the first and most successful tool in Tilly’s revenge strategy. Going from the shy, unflattering ‘Gert,’ to the vain, upper crust ‘Trudy,’ Snook slips comfortably into all aspects of her role while looking gorgeous in some of the picture’s most striking garments. Shane Bourne from television’s City Homicide (2007) does a solid job as Dungatar’s self-appointed Councillor Evan Pettyman, the town’s vile ringleader who employs a rival dressmaker from Melbourne, Una Pleasance (Sacha Horler), to compete with Tilly and drive her out of town, ironing out the competition. Partaking in extra-marital exploits whilst mentally abusing his long-suffering wife Marigold (Alison Whyte), Bourne fashions a rather nasty piece of work. Rivaling Pettyman’s maliciousness is Elsbeth Beaumont, played by Caroline Goodall, Hook (1991), a landed gentry who teams up with the Councillor to ruin her son, William’s marriage, when he plans to wed the formerly podgy Gertrude Pratt. Kerry Fox, Shallow Grave (1994), hams it up as the town’s monstrously twisted schoolteacher Beulah Harridiene whereas Barry Otto, Strictly Ballroom (1992), plays the cruel bigoted chemist of Dungatar, the hunchback Percival Almanac. 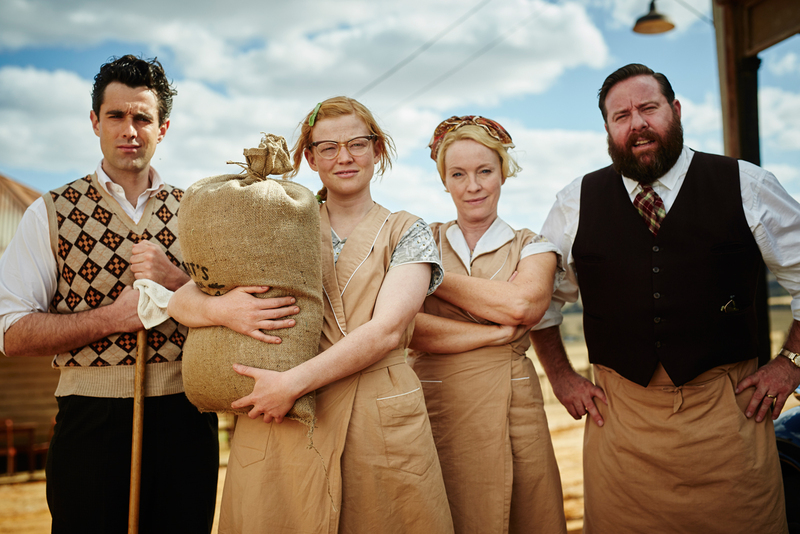 Finally, look out for Shane Jacobson, Kenny (2006), and Rebecca Gibney, Mental (2012), as Alvin and Muriel Pratt, owners of the Dungatar general store. Featuring exquisite frocks by costume designer Marion Boyce, Crocodile Dundee in Los Angeles (2001) — who produced more than 350 outfits for the film — which stand out alongside the picture’s batty characters and unconventional narrative, and Margot Wilson, Lawless (2012), who created all of Winslet’s attire, The Dressmaker looks fantastic. Even the wonderful production design by Roger Ford, Babe (1995), is a winner with the mid-century Australian town of Dungatar evoking a western American outpost. Although The Dressmaker has no qualms showing off its many ravishing virtues, the flick doesn’t always hang well. For instance, Kate Winslet, who’s about 40-years-old, is assumed to have been classmates with the 28-year-old Sarah Snook, while their teacher, played by Kerry Fox, is merely 49-years old. Additionally, Winslet’s romance with the 25-year-old Liam Hemsworth doesn’t add up either, particularly as he allegedly remembers the 40-year-old Tilly before she was even ostracized from Dungatar, despite the fact that he technically wouldn’t have been born yet — on the flip side, it’s nice to see an older woman with a younger man for a change! Either way, when the revenge-laden climax — involving a Macbeth production and a lengthy red carpet — drops, audiences will either write The Dressmaker off entirely or embrace the film wholeheartedly, even when it’s donning its preposterous harem pants. A dark, raucous caper film, The Dressmaker marks yet another triumph for Australian cinema, one that can sit proudly alongside the likes of Stephan Elliott’s hyper quirky features from the ’90s, the forgotten gem Welcome to Woop Woop (1997), and the cult classic The Adventures of Priscilla, Queen of the Desert. Moreover, director Jocelyn Moorhouse should be commended for her tremendous work and willingness to push the envelope here, creating a picture that’s brutal, funny and startling, a film that will no doubt catch many viewers off-guard whilst playing on Australia’s already idiosyncratic reputation. So hold onto your bonnets folks, this one will have you bursting at the seams! Never heard of this one… I’d have to check it out. I love Kate Winslet and I’m very much into dark humorous films. Great review!